We`re in London , it`s Sunday lunchtime and as always there`s only the one choice for us…. 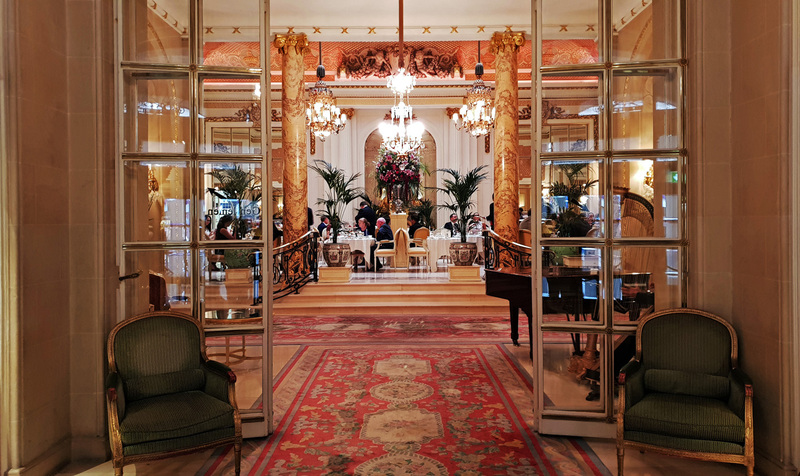 The Ritz. As always , it`s the 12.30 arrival ,the usual window table and the first diners to be seated in the dining room. 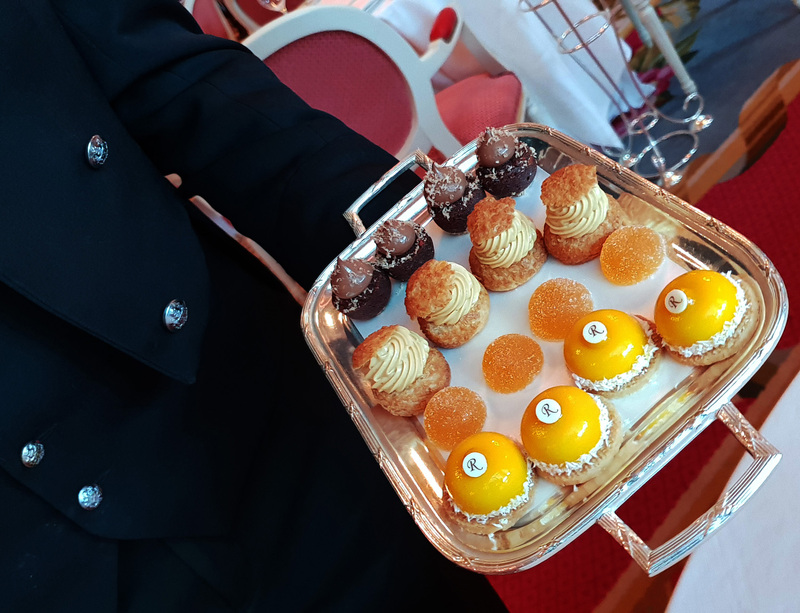 Our first course arrived at 1pm and our Petits fours arrived at 5.30 pm. To some diners a 5 hour meal would be unthinkable. To me , I call that foodie heaven. 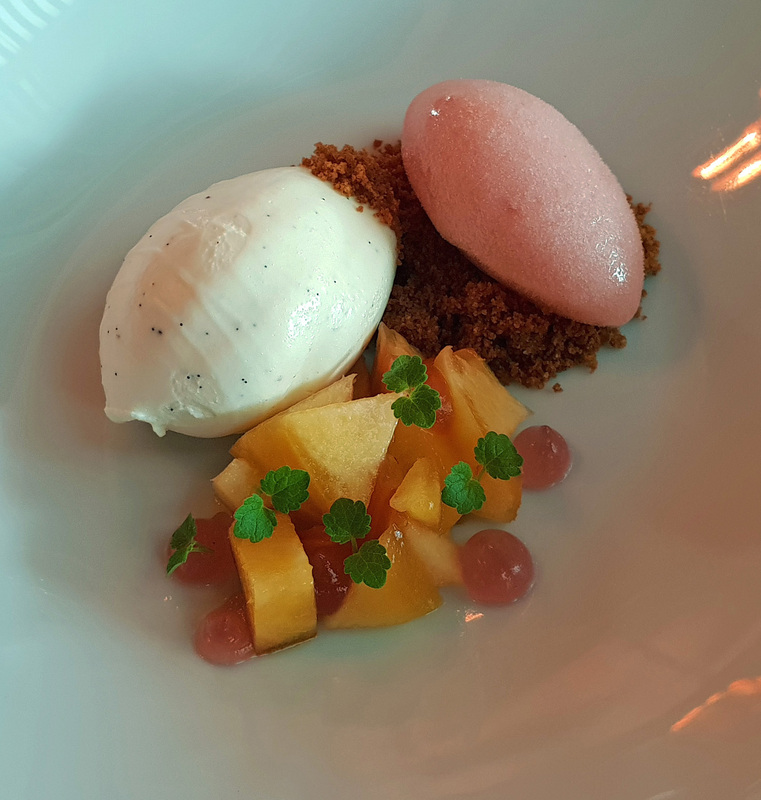 By the end of our meal the staff were even setting out for the start of the 6pm Dinner service , the Pianists fingers had worn out and i`m sure the staff were fed up of my non stop Yakking….sorry guys but we`ll be back again for more. 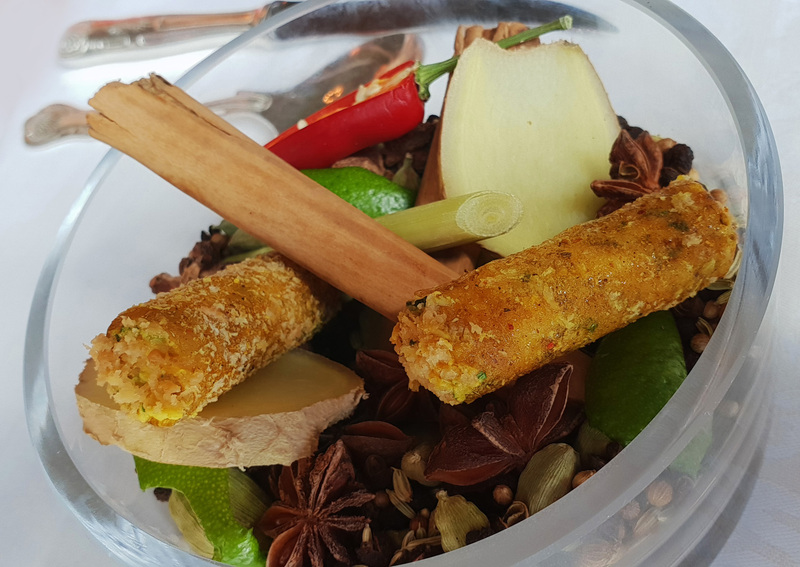 Coronation Chicken Tuiles – Lunch set off with these regular Ritz bites , they really are lovely and I would never tire of them. 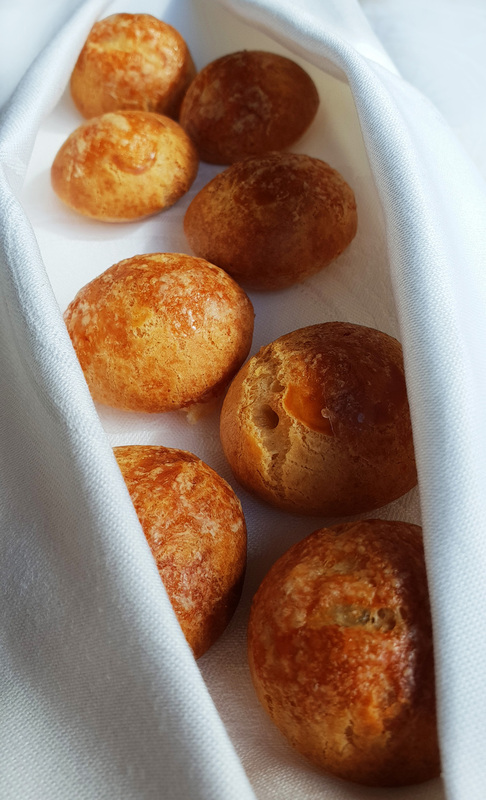 Truffle Gougere – Innocent looking from the outside but hiding a delectable Black Truffle surprise piped inside. 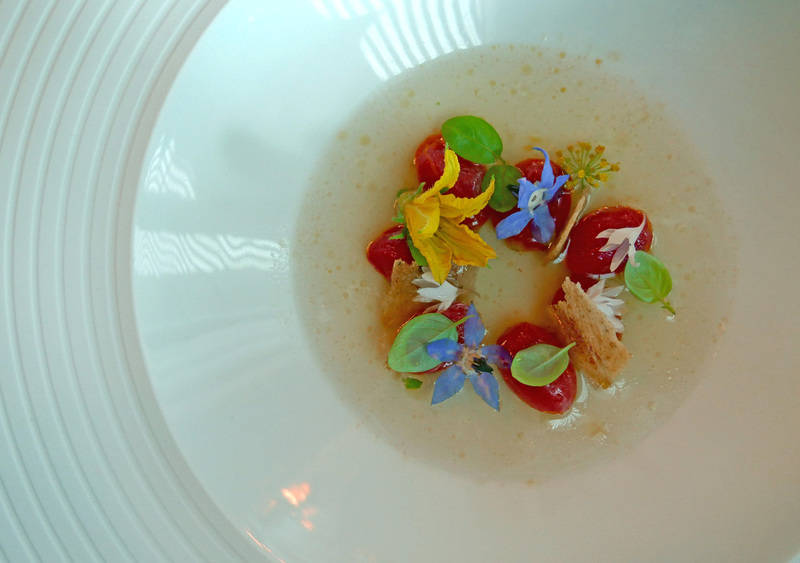 Tomatoes , Tomato Essence , Tartlets – The Perfume of Summer. I don`t think it would be possible to extract any more flavour from a Tomato. A refreshing starter. 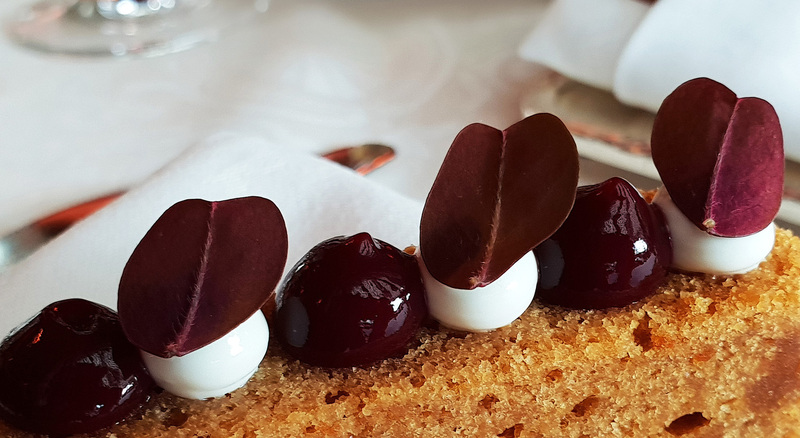 Goose Liver , Cherry , Purple Sorrel , Gingerbread – I stared at my plate when this course arrived , I knew the delight that was about to descend on me. 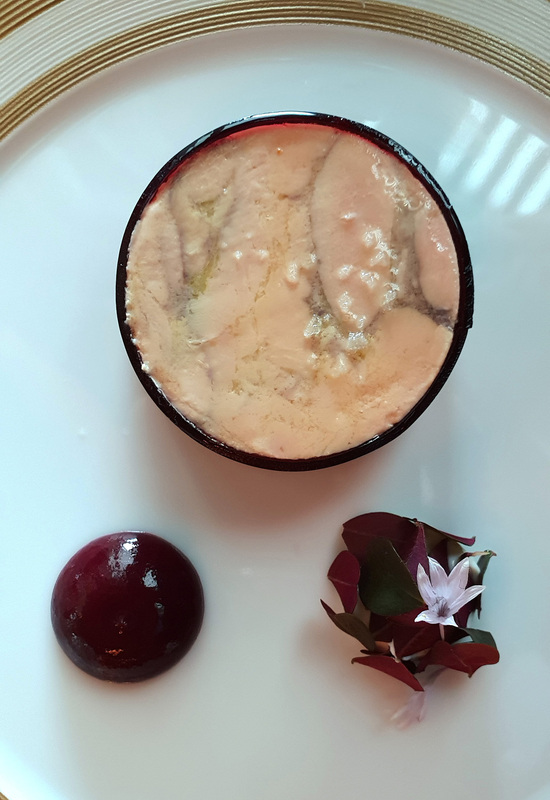 Foie Gras is my ultimate treat anywhere , ever. Married up to a good sweet wine , the culinary experience is second to none. An eyes closed moment , this for me is the finest food on the planet. 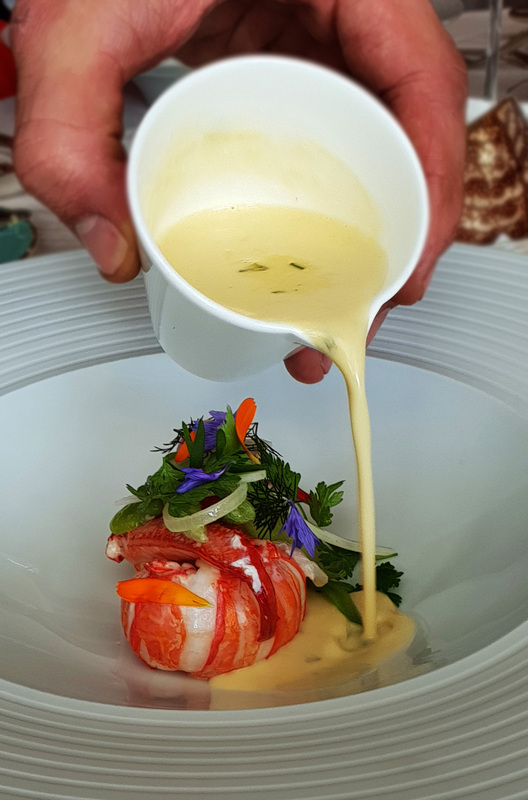 Scottish Langoustine a` la Nage – A Ritz classic , the very best Scottish Langoustines , a textbook sauce. 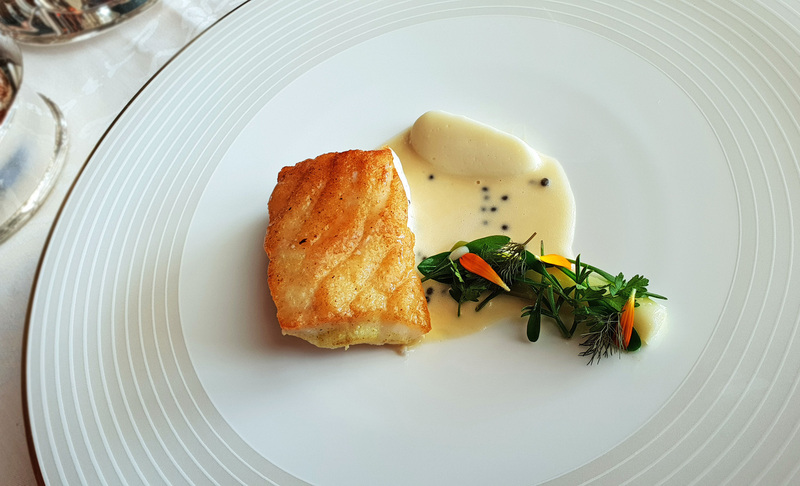 Simple basics cooked to absolute perfection. 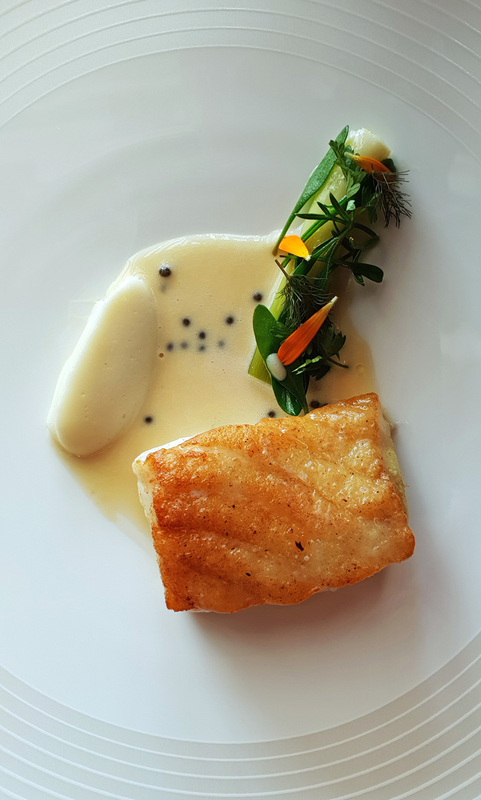 Cornish Turbot , Cauliflower puree , Baby Leek , Champagne Caviar sauce. 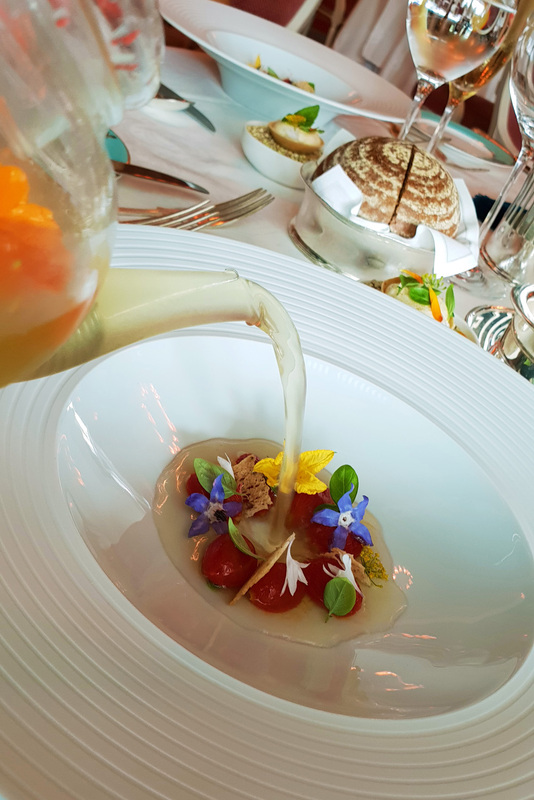 – Upon entering the kitchens the young Ritz Chefs are stripped back to cooking basics before they progress to the more specialist cuisine. Get the base skills right and then go from there (something a lot of modern restaurants totally lack). 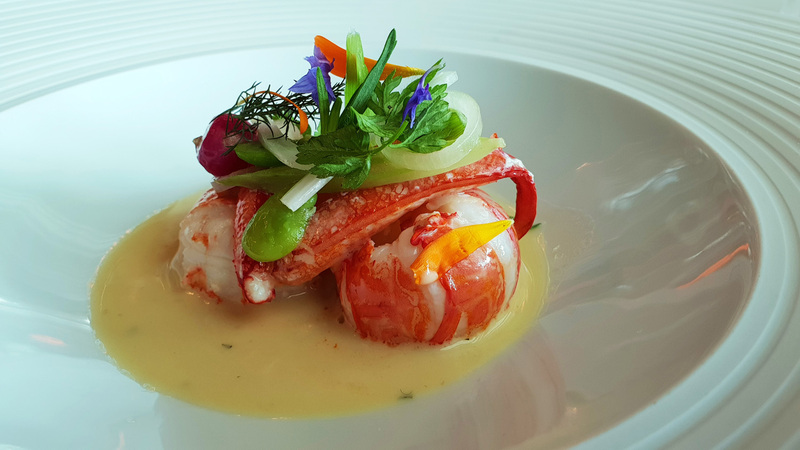 So once again , we`re served prime ingredients, respectfully treated , faultlessly cooked and beautifully presented. 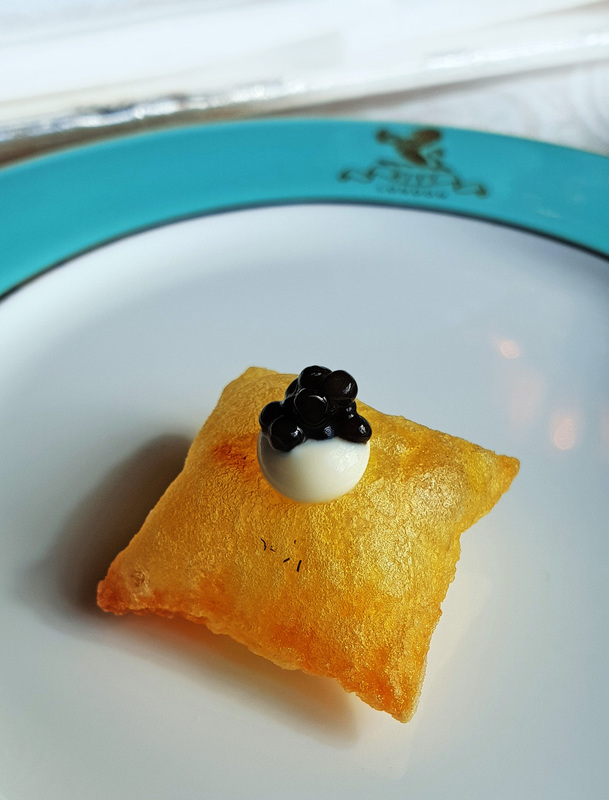 I know i`m always blowing the Ritz Trumpet but they just have everything sewed up to perfection here. 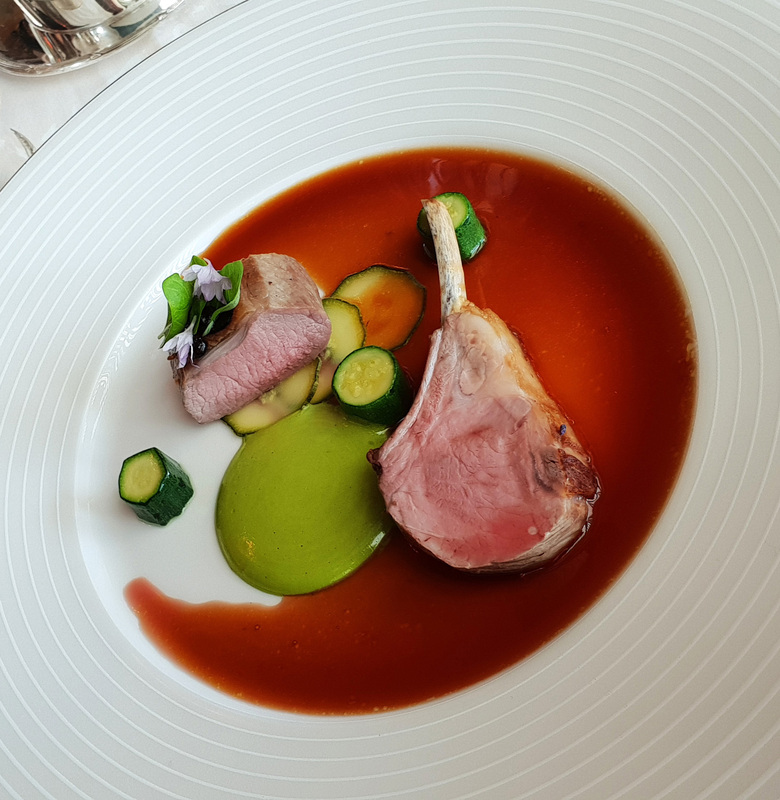 Seasonal Vegetables accompanied the Lamb. 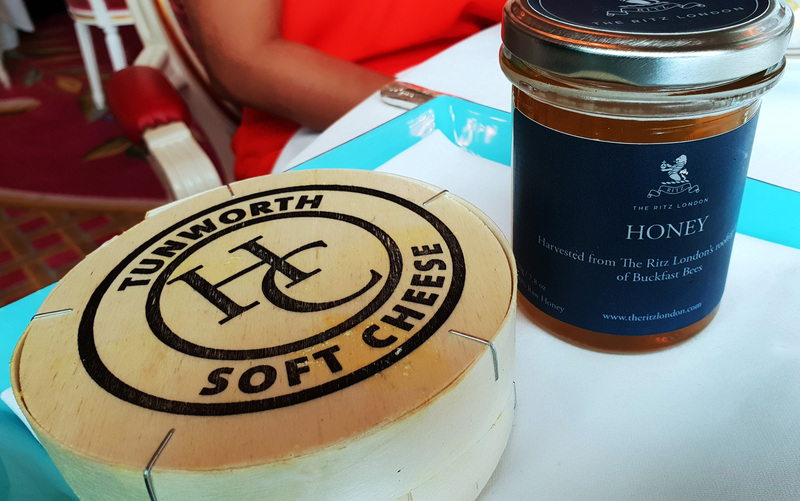 Tunworth soft cheese with Truffle and Ritz rooftop honey. 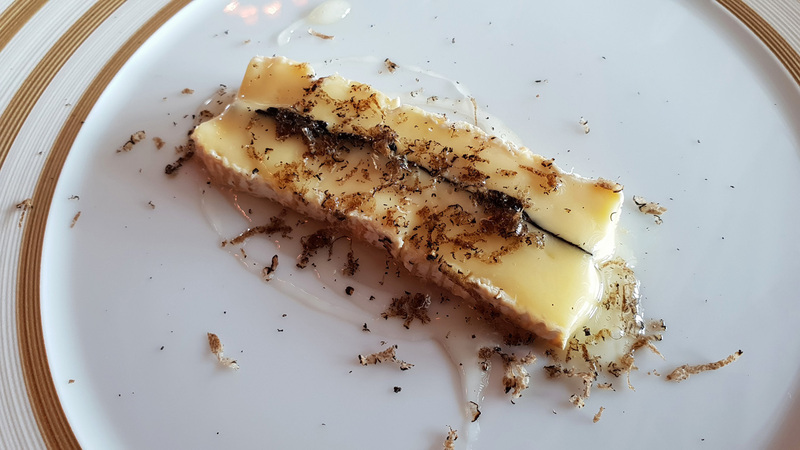 A beautiful marriage of matured Cheese with a layer of Black Truffle running through the centre. 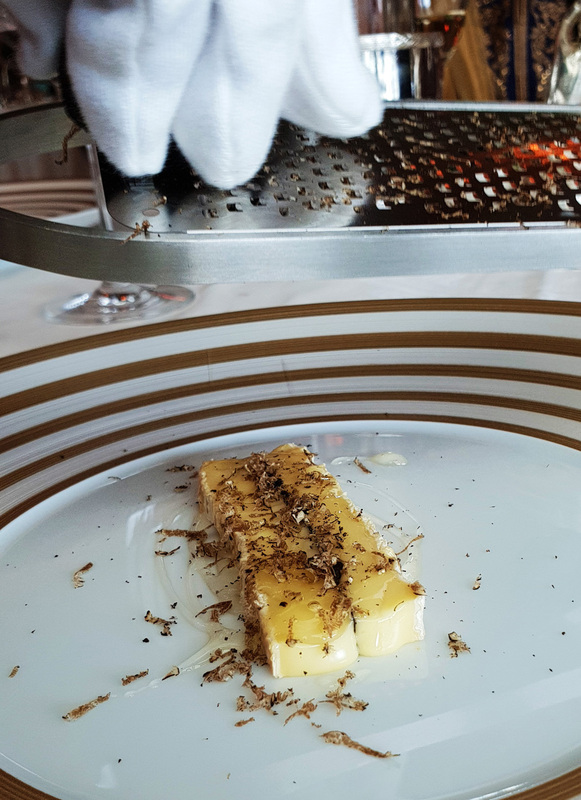 Chef presented the plate before drizzling over the Ritz`s own Honey from the Hives on the rooftop. 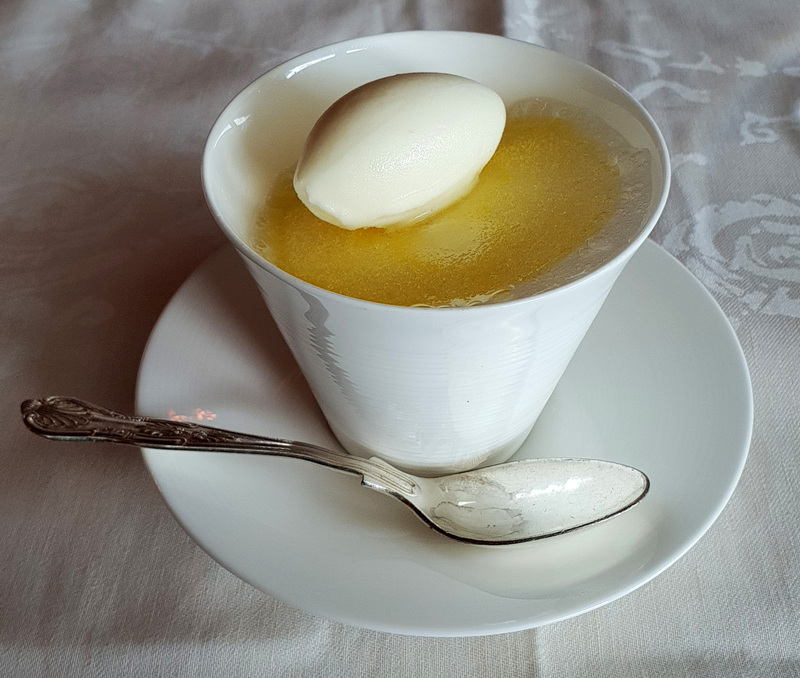 Lemon Posset – The first of four desserts from the Pastry section. 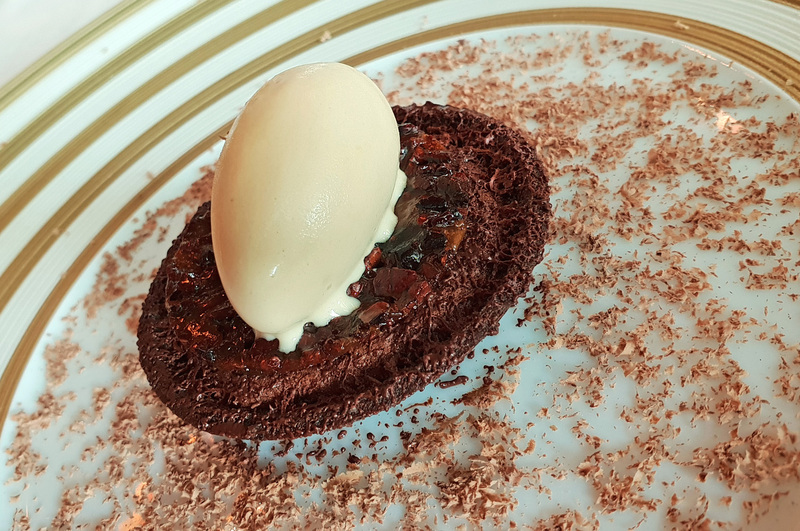 Chocolate Tart , ice cream – Not one the usual Ritz Masterpiece desserts but a well made Chocolate tart. Cheesecake cream , biscuit crumb , Ice cream. 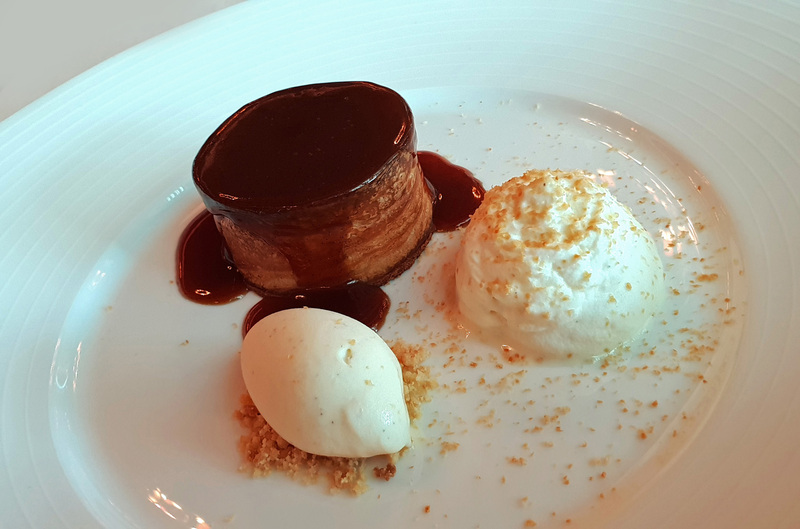 Caramelised Brioche , Apple and Ice cream , sticky toffee and Rum sauce.– For lovers of all things sweet , this dessert is a total sweet rush. 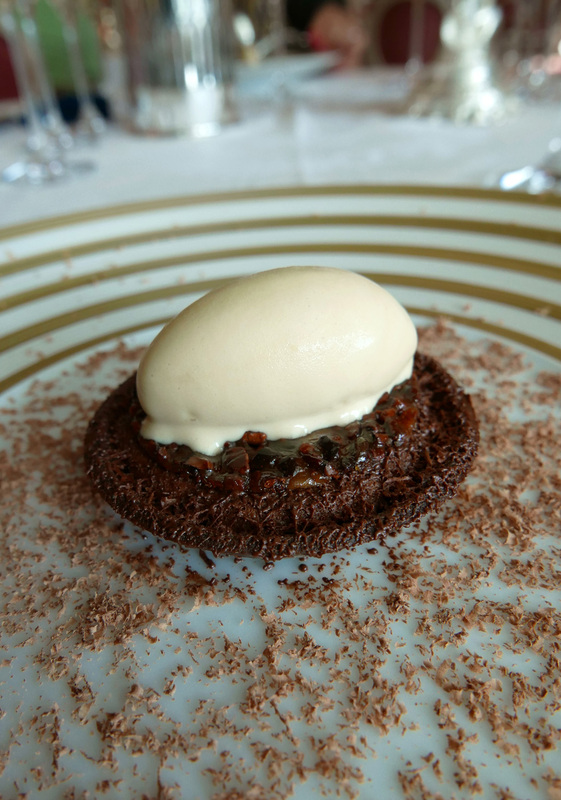 Who wouldn`t enjoy the flavours of the Sticky Toffee delights ? 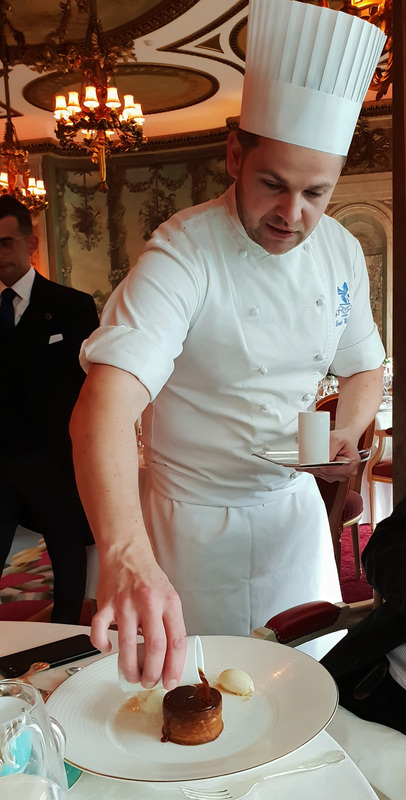 Chef Lewis Wilson , runs the Pastry section , such a major operation overseeing up to 400 afternoon teas every day….Top guy and one of the most skilled Pastry Chefs in the UK (If not the best). Selection of Ritz treats. We were truly overfed by this point so the sweets were boxed up for us to take away with us. They were all gone before bedtime that night. 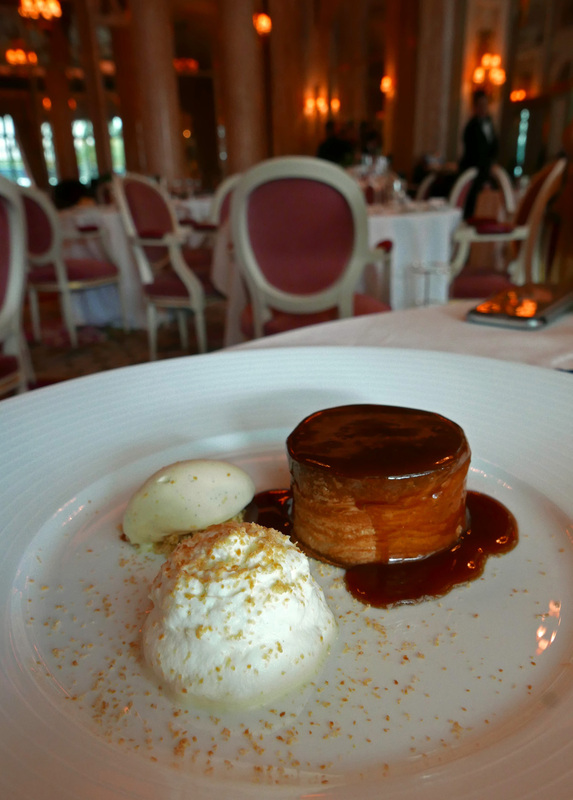 So once again , the Ritz ticked all the boxes of what i`m looking for in a Restaurant experience. 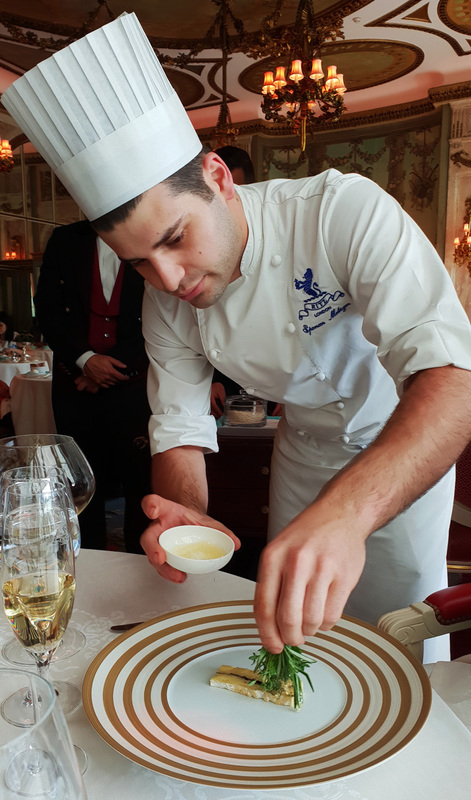 The Ritz is currently a 1 Michelin star restaurant , it`s extremely busy and the kitchens are huge with lots of staff who are on constant turnaround. It must be so difficult to orchestrate the various teams and keep consistency , but I personally feel that with a regular dedicated team they can achieve a second star in the not too distant future. 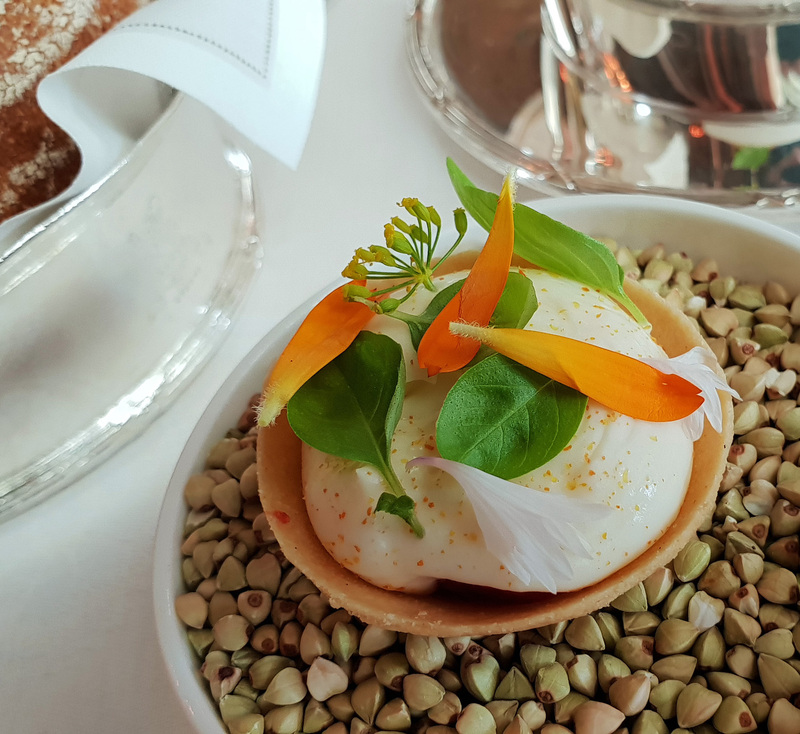 Many of the dishes i`ve eaten in the past are clearly 2 and 3 star creations so hopefully , fingers crossed the Ritz will continue to do great things. 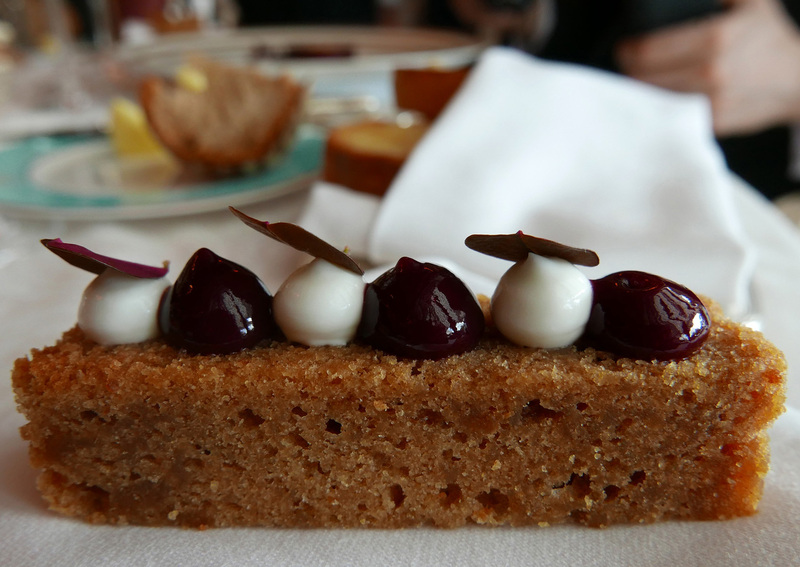 Previous Post Bibendum , London – As good as they say it is ? 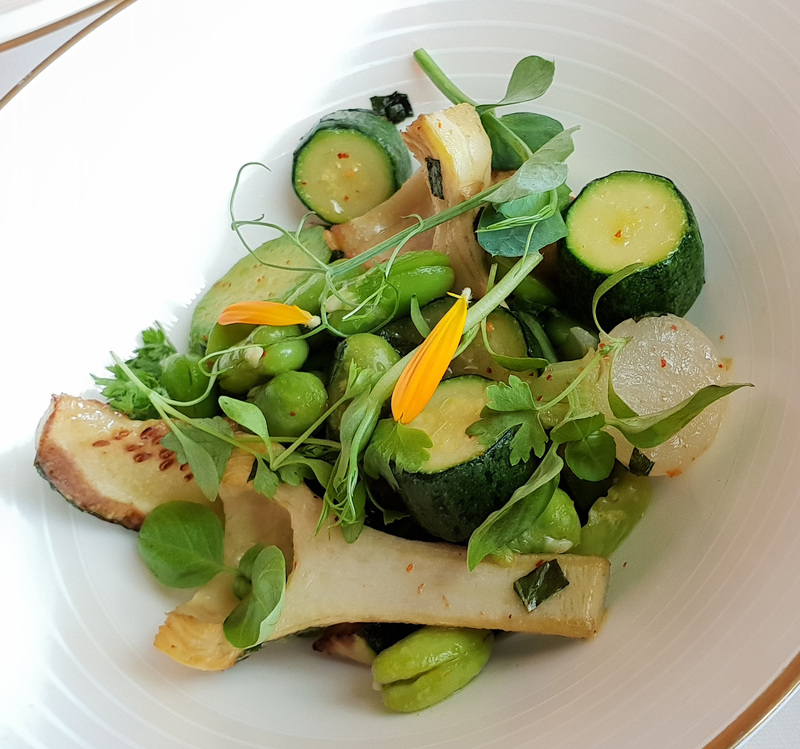 Next Post The Pentonbridge Inn – Cumbria.